Using a heat gun for your embossing techniques. ... is a Heat gun. A heat gun is something you need to invest in, if you wish to add embossing to your projects. This useful piece of equipment needn't cost a lot but it is something you will use over again, especially if you like the effect that embossing has on your projects. Take a look at the Embossing page and see the difference it has made to the "Teddy bear". She goes from dull and flat, to raised and shiny very quickly. The transformation to the notebook is something else. And both are very easy to achieve. Another project that this equipment can be used for is Shrink Plastic and this is a really fun material to work with. The heat gun comes in many sizes and price ranges, so it's best to shop around and find the one that you can handle easily. It gets very hot, so don't leave children unsupervised. The last thing you want is an accident. They look very similar to an ordinary hair dryer....but don't be fooled! They get much hotter and they don't blow as fiercely. If you make the mistake of using your hairdryer you will find that the embossing powder ends up anywhere but where you want it, and you will be left with a big mess to clear up!! And the hairdryer is not hot enough. Move the gun over the powder in order to melt it, and if there is a stand with it, then use it when you have finished to prevent burning your work surface. And another definite No! NO! is the paint stripper version that you would use in decorating, not a good idea and it gets very hot. 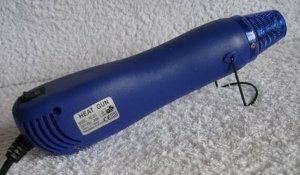 If used with care and looked after the heatgun will give you many years of good service, without any accidents too.